When the job calls for nailing large pieces of material together quickly and accurately, a framing nailer is the right tool. A framing nailer is a specific model of air gun. All power nailers are designed to make the carpenter's job easier by removing the need to hammer, but framing nailers are intended for quick, high-powered projects, unlike smaller models of power nailers that are used for only for precision work. Whether you're building a house or a doghouse, a framing nailer is an air gun that can take hours off your project time and save your muscles some undue soreness. 1.Decide whether a pneumatic framing nailer or a cordless framing nailer will best suit your needs. 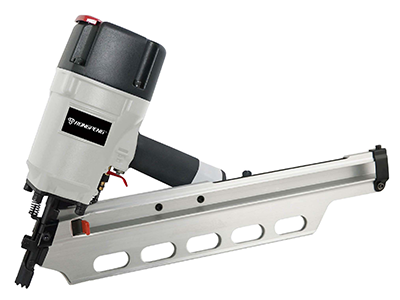 The majority of framing nailers are pneumatic, meaning they are air tools that draw their power from an air compressor, although both battery-powered and fuel-powered framing nailers are also widely available. If you don’t already own an air compressor and you’ll only be using your framing nailer for the occasional home-improvement project, such as installing siding or decking, a cordless nailer is perfectly acceptable. 2.Compare stick-style and coil-style framing nailers. Both styles use a magazine to store the nails, and choosing a style is often just a matter of personal preference. Because coil-style framing nailers use a round magazine, they are capable of storing significantly more nails than a stick-style nailer. If you’ll be using hundreds of nails at a time, a coil-style framing nailer will let you work for longer without stopping to reload the magazine. If you’ll be using less than 40 nails per project, a stick-style nailer will be adequate. 3.Inspect your air compressor if you’re considering a pneumatic framing nailer. Each framing nailer has a minimum requirement for air pressure and air volume, respectively listed as the pounds per square inch (PSI) and cubic feet per minute (CMF) ratings on your compressor. The framing nailer will not operate correctly if the air compressor’s ratings do not meet or exceed the nailer’s requirements. If you already operate other air tools off the compressor, you’ll need to add the framing nailer’s requirements to the combined load of the other tools. 4.Be cautious of framing nailers that accommodate only clipped-head nails. Many local building codes specify that all building and renovations must be done using round-head nails rather than clipped-head nails. Framing nailers that use clipped-head nails can store more nails than round-head nailers, but that advantage means little if clipped-head nails are in violation of the building code. 5.Look for features on the framing nailer that will make your job easier.